Throughout history almost every country in the world has, and without consent, been invaded, conquered, or overruled by neighboring nations for reasons only the callous heart can comprehend. However, in the midst of all this turmoil and devastation, one nation has denied such an insidious trend in an effort to preserve the life and culture of Southeast Asia. This culturally rich country is known today as Thailand, “The Land of Smiles”. Known for their warmth and unity as a whole, Thai people welcome in people from all areas of the world. With this influx of tourism one might wonder where all the cash flow is headed and how this money is used to help people alleviate poverty. This particular paper will aid in sharing the general factors that make up Thailand’s economy as well as point out the cultural dynamics that influence behaviors toward the handling of money on a daily basis. Also, added insight will be given on the current progress of microcredit loans and attitudes regarding them in Thailand. While every issue and avenue cannot be addressed here, a better understanding of Thailand’s mindset concerning the value of money may be more easily obtained. Thailand’s economy is export dependent, with a whopping 70% of GDP being constituted with export goods and services. Next to Indonesia, Thailand has the second largest economy in Southeast Asia and twenty-fourth in the world. However, the Thai economy has struggled several quandaries over the years. From 1997-1998, Thailand suffered the Asian Financial Crisis, which brought them a double-digit drop in their GDP. In order for them to recover, Thailand had to reluctantly rely on external demand from the United States and other foreign markets. After this incident their former Prime Minister, Thaksin upheld a “dual track” economic policy. This policy merged all domestic stimulus programs with Thailand’s traditional promotion of open markets and foreign investment. With a slow approach to the program, the Thai economy gradually began to strengthen their GDP. However, their progression towards a stable economy was met with opposition and difficult times. Several natural disasters have greatly impacted the economy including the current tsunami that occurred in Japan. Japan is one of Thailand’s largest export markets and after the tsunami it has been virtually impossible to do business with them. With each natural disaster there comes an added measure of resistance to their economic growth. Without intention, it indirectly upholds closures where they receive most of their consumer manufacturing. In the past they have had airport closures which have created tremendous barriers for export and import goods along with tourism. In other nations tourism may not be as big of a liability, but in Thailand tourism makes up approximately 6% of their GDP. If Thailand is left with any closures not only does the economy suffer and have to deal with the consequences, but the people of Thailand do as well. To better understand the ‘whys’ and ‘hows’ behind Thailand’s economy and the value they place on money, one must look at the key components that make up their culture. Professor Geert Hofstede conducted perhaps the most comprehensive study of how values in the workplace are influenced by culture. Five distinct dimensions make up Hofstede’s foundation for relative relations in cultural behavior. There is no set order in which they must be addressed but are constituted by the following categories: Power-Distance, Individualism-Collectivism, Masculine-Feminine, Uncertainty Avoidance, and Long-term-Short-term Orientation. If power distance is low, the majority of organizations and institutions (like the family) accept and expect that power is distributed unequally. This represents inequality (more versus less), but defined from below, not from above. It suggests that a society’s level of inequality is endorsed by the followers as much as by the leaders. Power and inequality, of course, are extremely fundamental facts of any society and anybody with some international experience will be aware that ‘all societies are unequal, but some are more unequal than others’. Individualism (IDV) on the one side versus its opposite, collectivism, that is the degree to which individuals are integrated into groups. On the individualist side we find societies in which the ties between individuals are loose: everyone is expected to look after him/herself and his/her immediate family. On the collectivist side, we find societies in which people from birth onwards are integrated into strong, cohesive in-groups, often extended families (with uncles, aunts and grandparents), which continue protecting them in exchange for unquestioning loyalty. The word ‘collectivism’ in this sense has no political meaning: it refers to the group, not to the state. Again, the issue addressed by this dimension is an extremely fundamental one, regarding all societies in the world. Masculinity (MAS) versus its opposite, femininity refers to the distribution of roles between the genders, which is another fundamental issue for any society to which a range of solutions are found. The IBM studies revealed that (a) women’s values differ less among societies than men’s values; (b) men’s values from one country to another contain a dimension from very assertive and competitive and maximally different from women’s values on the one side, to modest and caring and similar to women’s values on the other. The assertive pole has been called ‘masculine’ and the modest, caring pole ‘feminine’. The women in feminine countries have the same modest, caring values as the men; in the masculine countries they are somewhat assertive and competitive, but not as much as the men, so that these countries show a gap between men’s values and women’s values. Uncertainty Avoidance Index (UAI) deals with a society’s tolerance for uncertainty and ambiguity; it ultimately refers to man’s search for Truth. It indicates to what extent a culture programs its members to feel either uncomfortable or comfortable in unstructured situations. Unstructured situations are novel, unknown, surprising, and different from usual. Uncertainty avoiding cultures try to minimize the possibility of such situations by strict laws and rules, safety and security measures, and on the philosophical and religious level by a belief in absolute Truth; ‘there can only be one Truth and we have it’. People in uncertainty avoiding countries are also more emotional, and motivated by inner nervous energy. The opposite type, uncertainty accepting cultures, are more tolerant of opinions different from what they are used to; they try to have as few rules as possible, and on the philosophical and religious level they are relativist and allow many currents to flow side by side. People within these cultures are more phlegmatic and contemplative, and not expected by their environment to express emotions. Long-Term Orientation (LTO) versus short-term orientation: this fifth dimension was found in a study among students in 23 countries around the world, using a questionnaire designed by Chinese scholars It can be said to deal with Virtue regardless of Truth. Values associated with Long Term Orientation are thrift and perseverance; values associated with Short Term Orientation are respect for tradition, fulfilling social obligations, and protecting one’s ‘face’. Both the positively and the negatively rated values of this dimension are found in the teachings of Confucius, the most influential Chinese philosopher who lived around 500 B.C. ; however, the dimension also applies to countries without a Confucian heritage. With this fundamental knowledge of these five dimensions, it will now be easier to see specifically, Thailand fits into this model. Thailand is somewhat unique with its two highest Hofstede rankings being equal at 64 – Power Distance (PDI) and Uncertainty Avoidance (UAI). The high Power Distance (PDI) is indicative of a high level of inequality of power and wealth within the society. This condition is not necessarily forced upon the population, but rather accepted by the society as a part of their cultural heritage. The ranking of 64 is slightly lower than the Asian average of 71 (see Asian Average Graph below). The equally high Hofstede Dimension ranking of Uncertainty Avoidance (UAI) indicates the society’s low level of tolerance for uncertainty. In an effort to minimize or reduce this level of uncertainty, strict rules, laws, policies, and regulations are adopted and implemented. The ultimate goal of this population is to control everything in order to eliminate or avoid the unexpected. As a result of this high Uncertainty Avoidance characteristic, the society does not readily accept change and is very risk adverse. The Thailand rank of 64 is slightly higher than the Asian average of 58. 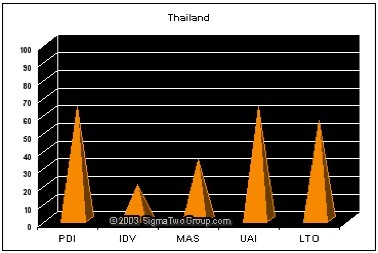 Thailand’s lowest Dimension is Individualism (IDV) at 20. A low score, as Thailand has, indicates the society is Collectivist as compared to Individualist. This is manifest in a close long-term commitment to the member ‘group’, is that a family, extended family, or extended relationships. Loyalty in a collectivist culture is paramount, and over-rides most other societal rules and regulations. The society fosters strong relationships where everyone takes responsibility for fellow members of their group. Thailand has the lowest Masculinity ranking among the Asian countries listed at 34, compared to the Asian average of 53 and the World average of 50. This lower level is indicative of a society with less assertiveness and competitiveness, as compared to one where these values are considered more important and significant. This situation also reinforces more traditional male and female roles within the population. From each unique dynamic that contributes to the rich life-force of modern day Thailand, it is quite clear why the so called “Land of the smiles” is open to outsiders while at the same time, still being able to maintain a deep-rooted unity nationwide. Also, high collectivism and power-distance, coupled with low uncertainty avoidance, helps to explain why elder males have controlled most of the financial issues within the family. They have dominating influence on the actions of others and would first give aid out to good friends, family, or village members before using finances to pay off bills or deposit excess income into a savings account. The internal nature to look after others has benefited local communities in terms of survival and social well being in the past, however, because many are uneducated on the subjects of personal finance and the power of savings, the vast majority of Thailand’s citizens continue to live in a vicious cycle of poverty and ignorance. Thailand is not known as a wealthy nation and is characterized by extreme disparities. However, Bangkok is where the real middle class market can be found. There are also a few smaller populations in the north such as Chiang Mai and some southern cities that contain middle class markets with a relatively higher disposable income. Approximately 40% of Thailand’s labor force is employed within agriculture and make around twenty to forty US dollars a month. Although it is cheaper to live in Thailand, Thai families make a very minimal amount to survive. Conversely, it would be ideal for these families to budget and practice saving their money, but Thai people love their luxury items. From a direct source in Thailand, Streeraska Sirivejcaphan stated that if people have the money to spend, they will. A lot of the Thai people’s spending is psychological. Meaning they search for quality in their purchases so they can flaunt their possessions. Thai buyers like to keep up with trends and with any additional income these consumers will give into buying pressure. As these trends have conduced consumers to inapt buying behaviors, saving is not a term very many Thai people are familiar with. With that said, is additional income truly beneficial when it simply contributes to impulse buying? In order to achieve a stable flow of income, Thai people first have to develop knowledge of budgeting and putting their skills into savings. Without being able to maintain a primary savings the Thai communities are lead into disparities. An issue that is relatively new to the United States is the idea of Microfinance and its capacity to help others help themselves out of poverty. The underlying areas for success or failure were mentioned above, but will now be the backing for how social, cultural, and economical ties influence microfinance throughout Thailand. At first glance one might conclude that the value of money is not of high importance to Thai people. However, this is not necessarily the case. One cause for such a reactionary thought is that the literacy rate, which is defined as the number of people aged 15 and over who can read and write, was only a moderate 92.6% of the population. In the 2000 census, the figures for Thailand were: males – 94.9% and females – 90.5%. While most can read and write adequately, the level and breadth of material provided includes mostly elementary-level books and social magazines. 21% of people in Thailand can speak English and the numbers are slowly starting to climb. As far as monetary matters are concerned Thailand spends 28% on education, 7% on military, and 11.3%. In Thailand, the 51 percent rule compels multinational corporations starting operations in Thailand to give 51 percent control to a Thai company in a joint venture. World Bank data shows that the percentage of the population living in households with consumption or income per person below the poverty line has decreased in each region of the world since 1990. Using the Bank of Thailand, Task Force on Agriculture Development as a source Thailand’s microfinance is allocated as such: Formal Sources: 47.5 %, Informal Sources: 52.5 %, Money Lenders (8.0 %); Semi-professional Money Lenders (42.5%); Friends and Relatives (45.1%); Others (4.4 %). According to the Microfinance information exchange, total MFIs in Thailand, across all dates 4 Gross loan portfolios USD, 2009 1.3 million Number of active borrowers 2009 is 4,860. Average loan balance per borrower USD, 2009 is 257.9. Deposits for USD, 2009 is 0.0. Total assets USD, 2009 is 1.3 million. Number of depositors 2009 is 0. From an excerpt published 2006 by the Thailand International Development Cooperation Agency (TICA) of the Ministry of Foreign Affairs and the United Nations Development Program (UNDP) in Thailand they declare that several decades of extensive community-based rural development programs undertaken by various government and non-governmental organizations in Thailand have resulted in the overall achievement of reducing poverty and improving rural well-being. Many of these community-based programs have been initiated or generated by local communities or villagers themselves. Experiences from these programs have shown that people are capable of initiating and managing development activities on their own. The communities’ initiatives are better responsive to their needs and problems, while enabling rural communities to find their own suitable solutions to these problems and to become self-reliant. This has been a rational for the Royal Thai Government’s adoption of “people-centered development” as clearly outlined since the 8th National Economic and Social Development Plan to the current 9th National Plan. One of these successful community-based development programs is a microfinance scheme, which aims to mobilize local financial resources to help rural people solve their problems and to serve as resource for their community’s activities. This microfinance scheme has emerged as an effective medium through which credit can reach the poor. It is a key instrument for poverty alleviation efforts at the community level. In Thailand, there are several community-generated microfinance projects implemented by different communities and local NGOs nationwide. With this development through the years, Thailand can share their lessons learned and best practices in this area with other developing countries within the region and beyond. But the social benefits have also been significant: the sense of belonging and participation that are emerging through local community financial management. Many village committees take it upon themselves to use a portion of their profits for disadvantaged local non-members with public welfare projects for children and the elderly, for example (as a form of micro-CSR). From a knowledge management sense, we are seeing the growth of learning networks between committees and agency staff, so that best and worst practices are shared and adapted in formal and informal ways. One of the success benchmarks in Thailand’s history is the ‘Million Baht Village Fund’ program. The program, introduced in 2001, is the largest scale government microfinance initiative in the world to date — costing about 1.5 percent of GDP. They used both pre- and post-program panel data, and quasi-experimental variation stemming from the way credit was given to different villages, to evaluate the short run impacts on the villages receiving the program. It was found that the village funds have increased total short-term credit, consumption, and income growth but decreased asset growth. Credit increased for agricultural investment and consumption, and interest rates increased, as did default rates and informal borrowing in the year after loans. Agricultural investment increased, while business investment did not. Nonetheless, business income increased (especially in female-headed households) as did labor income. The average interest rates in Thailand are surprisingly low compared to neighboring countries. Rates in Thailand usually range from 10-20% per year while Cambodia and Vietnam have interest rates around 30-50% per year. This is due primarily to the fact that the government heavily subsidizes the rates. Most experts in the micro-credit industry think that government involvement in micro-credit can have two negative effects. Government subsidies can distort markets and usually limits growth. The programs could potentially be used for political purposes. For the majority of citizens in first-world countries they often ask themselves what exactly is microfinance. To give a basic understanding of this relatively new credit system below is a simple outline to its functions and history. What is Micro-Credit? Micro-credit is the extension of very small loans (microloans) to the unemployed, to poor entrepreneurs, marginalized people and to others living in poverty who are not considered bankable. These individuals lack collateral, steady employment and a verifiable credit history and therefore cannot meet even the most minimal qualifications to gain access to traditional credit. Micro-credit is a part of microfinance, which is the provision of a wider range of financial services to the very poor such as insurance and savings. Micro-credit started in Bangladesh where it has successfully enabled extremely impoverished people to engage in self-employment projects that allow them to generate an income and, in many cases, begins to build wealth and exit poverty. The concept of micro-credit has become so popular that the United Nations declared 2005 the International Year of Micro-credit. In 2006, the Nobel Peace Prize also went to Dr. Yunus and his organization for their work with the poor. What is a Microfinance Institution (MFI)? A microfinance institution is an organization that offers financial services to low income populations. This includes NGOs, credit unions, cooperatives, private commercial banks and non- bank financial institutions (some that have transformed from NGOs into regulated institutions) and parts of state-owned banks such as the Government Savings Bank and BAAC. A lot of NGOs and foundation also offer micro-credit in Thailand. However; most also offer other non-financial development activities and prefer not to be called a “financial institutions”. Yet, from an industry perspective, since they are engaged in supplying financial services to the poor, we call them MFIs. Who are the clients of microfinance? The typical microfinance clients are low-income persons that have little or no access to formal financial institutions. Microfinance clients are typically self-employed, often household-based entrepreneurs. In rural areas, they are usually small farmers and others who are engaged in small income-generating activities such as food processing and petty trade. In urban areas, microfinance activities are more diverse and include shopkeepers, service providers, artisans, street vendors, etc. Microfinance clients are poor and vulnerable non-poor who have a relatively stable source of income. How does microfinance help the poor? Experience shows that microfinance can help the poor to increase income, build viable businesses, and reduce their vulnerability to external shocks. It can also be a powerful instrument for self-empowerment by enabling the poor, especially women, to become economic agents of change. Poverty is multi-dimensional. By providing access to financial services, microfinance plays an important role in the fight against the many aspects of poverty. For instance, income generation from a business helps not only the business activity expand but also contributes to household income and its attendant benefits on food security, children’s education, etc. Moreover, for women, who, in many contexts, are secluded from public space, transacting with formal institutions can also build confidence and empowerment. Aren’t the poor too poor to save? The poor already save in ways that we may not consider as “normal” savings— investing in assets, for example, that can be easily exchanged to cash in the future (gold jewelry, domestic animals, building materials, etc.). After all, they face the same series of sudden demands for cash we all face: illness, school fees, and need to expand the dwelling, burial, and weddings. These informal ways that people save are not without their problems. It is hard to cut off one leg of a cow that represents a family’s savings mechanism when the sudden need for a small amount of cash arises. Or, if a poor woman has loaned her “saved” funds to a family member in order to keep them safe from theft (since the alternative would be to keep the funds stored under her mattress), these may not be readily available when the woman needs them. The poor need savings that are both safe and liquid. They care less about the interest rates that they can earn on the savings, since they are not used to saving in financial instruments and they place such a high premium on having savings readily available to meet emergency needs and accumulate assets. Why do MFIs charge such high interest rates to poor people? Providing financial services to poor people is quite expensive, especially in relation to the size of the transactions involved. This is one of the most important reasons why banks don’t make small loans. A 5000 baht loan, for example, requires the same personnel and resources as a 200,000 one thus increasing per unit transaction costs. Since most poor people are also in rural areas, micro-credit programs must also spend additional money to travel to clients. The microfinance institution could subsidize the loans to make the credit more “affordable” to the poor. Many do. However, the institution then depends on permanent subsidy. Subsidy- dependent programs are always fighting to maintain their levels of activity against budget cuts, and seldom grow significantly. They simply aren’t sustainable, especially if other micro-credit operations have shown that they can provide credit and grow on the basis of “high” rates of interest—and along the way serve far greater numbers of clients. Evidence shows that clients willingly pay the higher interest rates necessary to assure long-term access to credit. They recognize that their alternatives—even higher interest rates in the informal finance sector (moneylenders, etc.) or simply no access to credit—are much less attractive for them. Interest rates in the informal sector can be as high as 20 percent per day among some urban market vendors. Overall the microfinance situation in Thailand has had its ups and down but continues to engage and take root in various villages throughout the country. With help from sustainable countries and credible sources, there is hope for alleviating much of Thailand’s poverty through the use of its own resources and the strength of its people. Cultural Dimensions-Thailand. ITIM International, 2009. Web. 28 Apr 2011. 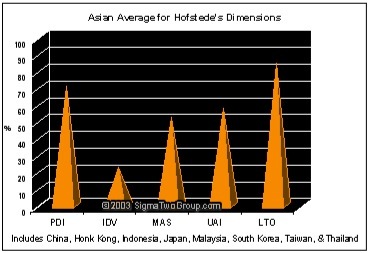 <• http://www.geert-hofstede.com/hofstede_thailand.shtml>. Microfinance Thailamd. Microfinance Thailand, 09/2009. Web. 28 Apr 2011. <• http://www.microfinancethailand.com/faq.htm>. Micrfinance Country Information. N.p., 1990. Web. 28 Apr 2011. <http://www.gdrc.org/icm/country/asia-thailand.html>. “Microfinance in Thailand.” Mix Microfinance Information Exchange, 2009. Web. 28 Apr 2011. <http://www.mixmarket.org/mfi/country/Thailand>. Index Mundi. CIA World Factbook, 14/04/2011. Web. 28 Apr 2011. FITA. Export Enterprises, 04/2011. Web. 28 Apr 2011. <http://www.fita.org/countries/thailand.html>. “Thailand Asia-Economy.” TDS. Travel Document Systems, 2011. Web. 28 Apr 2011. <http://www.traveldocs.com/th/economy.htm>.